Cross-Border Commerce Europe has released a piece of research covering and ranking the 500 strongest European players with a focus on cross-border e-commerce performance. Total online EU cross-border market represents a turnover of €95 billions in 2018 (excluding travel). The analysis arose from a simple observation: there are currently no European cross-border figures that measure performance of cross-border retailers headquarted in Europe. Cross-border e-commerce is defined as a purchase in an online store that is located in another country and jurisdiction. The goal of the research is to provide up to date information and stimulate online cross-border sales within the European Union. In 2018 Cross-border e-commerce revenues (including travel) reached €137 billions in Europe; an increase of 13.2% compared to 2017. The cross-border share of total online sales in Europe (EU16) is 22.8%. Cross-border trade (excluding travel) amounts to €95 billions in 2018 with the following distribution: 55% is generated by players from within the European Union and 45% by retailers from outside the EU. Within the EU16, € 36 billions are generated by the Top 500 Cross-Border Retail Europe “made in Europe”, of which 24.7% comes from “marketplaces”. The share of “Pure Players” is 40% and half of it is located in the category “fashion, jewelry and baby”. Within retailers outside the European Union, 80% of cross-border sales are generated through ‘marketplaces’ with Amazon leading with € 32 billions sales. European players in the cross-border online sales build pan-European brands. They are ambitious, think globally but adjust themselves locally where needed. 23.6% of Europeans appreciate the convenience of cross-border eCommerce and asks the decision-makers in the Commission and the European Parliament to further simplify tax and cross-border rules. Despite Brexit, they strongly believe in a promising future for cross-border e-commerce in Europe. 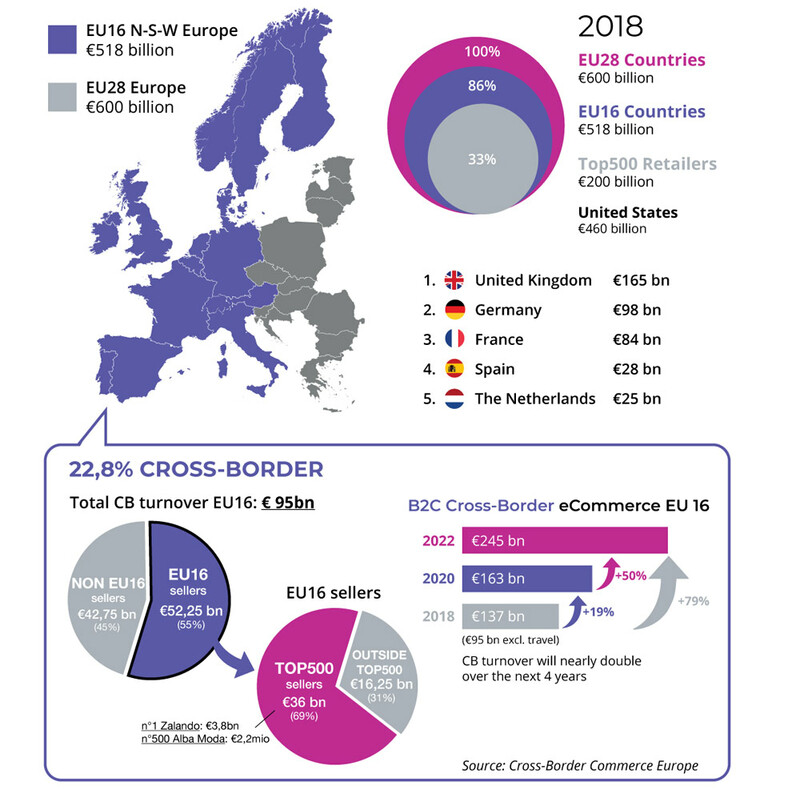 The post EU cross-border e-commerce market hits €137 billion in 2018 appeared first on Payments Cards & Mobile.